From the grand arcaded buildings surrounding it on all four sides, to the hundreds of locals and visitors milling about, Plaza Mayor is the quintessential Madrid destination. There’s always something going on here — whether it’s an impromptu street performance or a charming holiday market — and it makes for a gorgeous photo op as well. Here’s everything you need to know before making your way to one of Madrid’s top sights. Though its timeless appearance may give the impression that Plaza Mayor has been around forever, that’s not the case. In fact, back in the 15th century it was an entirely different square known as Plaza del Arrabal, home to a vibrant, bustling market. Even for centuries before that, even, the space had hosted bullfights, live performances, coronations, and so much more. Suffice it to say that what is now Plaza Mayor has been one of Madrid’s most important destinations practically since the beginning of recorded history. The plaza we see today is relatively young in comparison to the centuries of history that precede it. In 1790, architect Juan de Villanueva rebuilt the square nearly from scratch after a series of devastating fires. Not only did the architecture of the reconstructed plaza help prevent future blazes, but it also gave the square the iconic form we know and love today. Despite its name, the former Casa de la Panadería (“Bakery House”) no longer offers bread and sweet treats. However, at the time of its construction in the late 16th century, it was Madrid’s main bakery, famous for its affordable prices that allowed even the city’s poorest residents to buy bread. The bakery structure served as the model for the rest of the buildings surrounding the square, but the decorations on the façade have changed numerous times over the centuries. Today, only the cellar and ground floor of the original building remain, housing the Madrid tourist information center. One of architect Villanueva’s most important changes in the 1790 redesign of Plaza Mayor was the installation of several arches leading into the square from the surrounding streets. The largest and most well-known is the Arco de Cuchilleros, which allows access from one of the most picturesque streets up to the square via a series of steep stairs. The arch takes its name from the knifemakers (cuchilleros) that existed here long ago, supplying knives to the various butchers in Plaza Mayor. Smack dab in the center of the square is a majestic statue of King Philip III on horseback. Said to be one of the most valuable works of art on the streets of Madrid, the iconic statue dates back to 1616. For a few centuries, it stood at the entrance to the sprawling Casa de Campo park just west of the city. 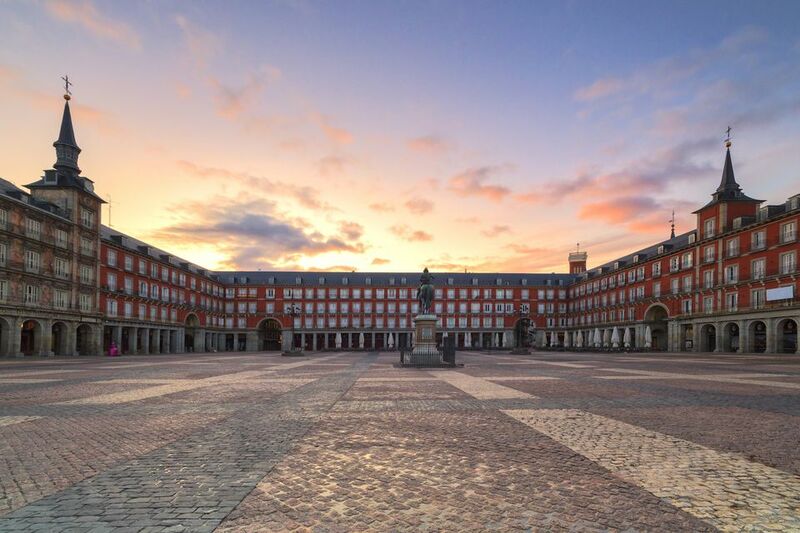 However, in 1848, Queen Isabel II had the statue moved to its present-day location in Plaza Mayor. With a compact design and world-class public transportation system, Madrid is one of the easiest European capitals to navigate. That means getting to major tourist attractions like Plaza Mayor is a piece of cake. It’s a five- and six-minute walk respectively from Puerta del Sol (Madrid’s other iconic plaza) and the Royal Palace, making it easy to access on foot as you go about your day sightseeing. If you find yourself a bit further out, no worries. Hop on metro line 1 and make your way to Sol, or get on line 5 and head to Ópera. The plaza is just a short walk down the street from either station. Despite being the most recognizable sight in Madrid, Plaza Mayor isn’t the end-all-be-all of things to see and do in the Spanish capital. In fact, it serves as a great starting point for exploring the rest of the city. As mentioned above, two of Madrid’s other iconic locales are just down the street from Plaza Mayor. Head east to get to Puerta del Sol, where you’ll find the famous oso y madroño statue as well as the geographic center of Spain at Kilometer 0. Heading west, you’ll eventually get to the Royal Palace, the official residence of Spain’s royal family and a gorgeous historical building in its own right. Getting hungry? Avoid the temptation of the dozens of picturesque bar and restaurant terraces spilling out onto the square. These places tend to be touristy and are overpriced for the quality of the food (you’re essentially paying for the views). Instead, make your way down one of the side streets leading up to the plaza. Here, you’ll find more no-frills, hole-in-the-wall bars than you can count, all packed to the brim with locals. Pop into any one of them (La Campana is a popular choice among madrileños) and order the city’s signature sandwich, a fried calamari bocadillo. Just don’t forget to wash it down with an ice cold beer.